The Neat Company Adds Multi-Account Access to Streamline the Work of Accounting and Bookkeeping firms. Accountants and bookkeepers in the Neat partner program can now efficiently manage multiple clients through a single dashboard. Philadelphia, June 13, 2018 – The Neat Company, a recognized leader in expense tracking and bookkeeping automation solutions for small businesses, announced today the availability of Multi-Account Access. With Multi-Account Access, accountants and bookkeepers can onboard and manage an unlimited number of customers from a single dashboard within the application. Multi-Account Access has been in beta with a select group of Neat’s accounting advisors and will be unveiled to the industry during Scaling New Heights 2018 in Atlanta June 17th to the 20th. Neat has been a popular solution for accountants and bookkeepers for years, and today and boasts over 10,000 accounting and bookkeeping professionals as users. The main value proposition of Neat is that it makes it very easy for a firm’s client to upload business expenses into Neat which in-turn, automates time-consuming data-entry into QuickBooks. Partners will enjoy a myriad of benefits from the Neat Freak program including the revenue sharing, feature on the Neat accountant/bookkeeper locator and monthly and annual contests. Multi-Account Access is available with Neat Premium and Neat Business editions at no additional cost. To learn more about the Neat’s Neat-Freak partnership program, click here. 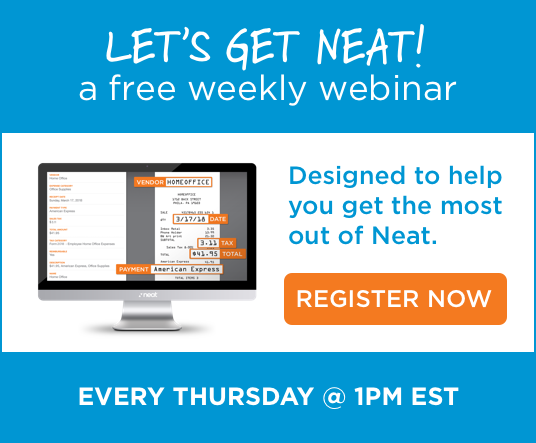 About Neat®: The Neat Company provides small businesses and sole proprietors with cloud-based expense and document management system, which streamlines the collection and retention of important financial documents, automatically extracts key information, and provides real-time insights to automate time-consuming bookkeeping tasks. Neat’s patented ID2 technology intuitively classifies documents and populates key data fields, helping small businesses organize and categorize financial information that is critical to their business’s needs. In order to manage the high, daily volume of expense transactions and financial documents, Neat gives small business owners the power to capture and access files from any device, taking productivity to the next level. By consolidating reporting and eliminating time-consuming tasks like data entry, Neat streamlines accounting and tax-related workflows, giving time back to small businesses so they can get to what matters most.